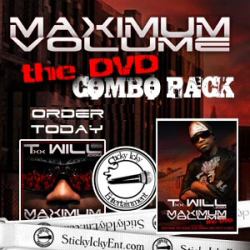 Txx Will just released his MAXIMUM VOLUME DVD and now is your chance to get the combo pack now. The combo pack includes the MAXIMUM VOLUME CD & DVD, a Sticky Icky Entertainment Sticker and Lanyard. All these items for 24.99 is a great deal. Keep on the lookout for the next Txx Will project. MAXIMUM VOLUME Combo Pack available now.